ATHENS, O.H. 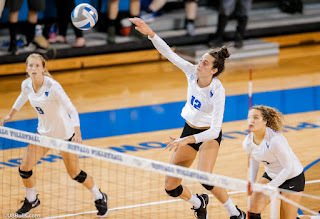 -- The University at Buffalo volleyball team picked up their first Mid-American Conference win on Friday evening as the Bulls earned their first ever victory at Ohio with a come from behind 3-2 victory against the Bobcats. With the win, the Bulls improve to 9-6 on the season and 1-2 in league play. UB took the match 25-22, 17-25, 22-25, 26-24, 15-9. The Bulls took the opening set as a kill from sophomore Andrea Mitrovic opened a 14-7 advantage. Buffalo extended its lead to 17-11 before Ohio came all the way back to pull within 23-21 late. A kill from Mitrovic clinched the opening set. The Bobcats then came back to win the second and third sets, taking a 2-1 lead, but the Bulls were not to be denied. UB led 17-13 in the fourth set following a kill from junior Rachel Sanks, but the Bobcats would come back and take a 23-22 lead. UB scored two straight points to lead 24-23, but Ohio fought off one set point. With the set tied at 24-24, the Bulls got another kill from Sanks and then a service ace from freshman Paige Beck, which clinched the fourth and sent the match to a fifth and deciding set. Mitrovic recorded an early kill to give Buffalo the 5-2 advantage before Ohio came back to tie it up at 6-6. UB responded with a 5-1 run, capped off on a block form Megan Wernette and Scout McLerran, giving UB the 11-7 lead. A solo block from Mitrovic put the final exclamation point on the night, clinching the set and the match. Mitrovic ended the evening with a new career high 25 kills, while Wernette finished with 12 kills and just two errors, hitting .500 for the night. Sanks added nine kills, while Kristina Nieves had seven and Polina Prokudina added six. McLerran had six kills, while also finishing with 47 assists and 14 digs to complete the double-double. As a squad, the Bulls finished with five aces, led by two from junior Hannah Watson. Defensively, UB had 78 digs led by 17 from senior Larra Bickelhaupt. Beck added 15 for the Bulls. UB also had 7.0 total blocks, paced by three solo blocks from Mitrovic. The Bulls will conclude the weekend with a meeting against Kent State.